Fixed video surveillance solutions are poised to become one of the most powerful and productive technology tools in every part of the globe. A video camera placed in a secluded dormitory or factory entryway. Video monitoring of remote parking lots at corporations, universities, shopping malls, sports arenas and airports. Remote visual surveillance of mission-critical technology and capital assets, such as auxiliary facilities, extended pipelines and storage areas. Real-time transmission of video and other data to provide actionable information and enable real-time response. As organizations address the implementation of fi xed video surveillance solutions, they must carefully consider the most important factors, in particular the Big Three issues concerning the infrastructure required to support cameras at selected locations: cost, deployment time and performance. While deploying a common architecture across the video network is relatively straightforward, there are many unique situations within a network that can be more effi ciently connected with fi xed Point-to-Point (PTP), Point-to-Multipoint (PMP) or Mesh wireless broadband infrastructure. An understanding of the array of wireless technology solutions will enable network integrators, architects and operators to select the architecture and equipment that best meet the Big Three requirements for a specifi c fi xed video surveillance application. Flexibility is one of the strong suits of wireless broadband technology. No matter which type of architecture you currently have in place, IP-based network solutions are proven to provide the cost-effective deployment and high-speed performance needed to facilitate future growth. Where analog Closed Circuit Television (CCTV) networks are deployed, operators can easily add IP-based systems to augment the capabilities. There is no need to incur the cost and time of replacing these installations. IP-based systems can complement the existing network via a video encoder that is discussed later in this paper. 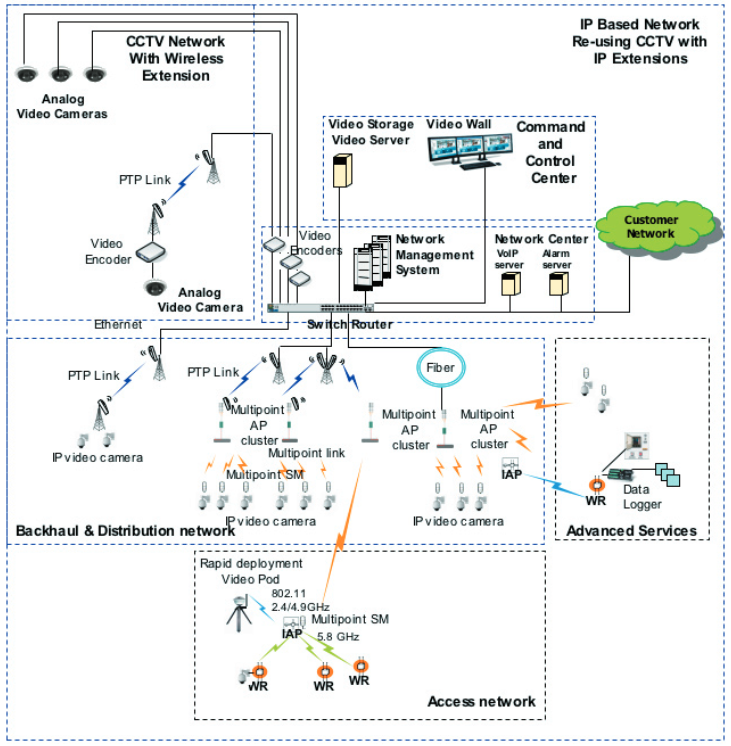 Figure 1 shows a typical video surveillance architecture for a CCTV system. Where CCTV surveillance networks do not yet exist, network operators have the opportunity to create a new, completely IP-based surveillance solution that minimizes cost of installation and time to deployment while maximizing performance. As organizations prepare to deploy or extend fixed video surveillance networks, there are a number of considerations that must be examined. The most fundamental is choice of technology, a factor taking on increasingly new importance with the emergence of today’s powerful IP-based video surveillance networks. Many organizations have already deployed wire-based solutions, but understand the numerous issues inherent in building out a fi ber infrastructure with more fi ber. Many others are in the planning stages of deploying new video surveillance networks,and are seriously exploring the selection of wireless broadband infrastructures. It’s not surprising that IP-based networks are being chosen by rapidly growing numbers of organizations. The advantages of high-speed wireless solutions are exceptional in both performance and cost-effectiveness. Wireless broadband video surveillance networks eliminate the problem of having camera placement dictated by wire or cable accessibility. With wireless, network operators and managers can place video cameras precisely where they are needed. They can also eliminate the cost of running cable. Wireless connectivity also enables reliable, cost effective and fast deployment of networks. Different wireless equipment can be combined to provide the most cost effective connectivity to meet the requirements of camera placement and actionable, real-time data transmission. wireless IP systems can be used to not only enable video surveillance, but also to provide a common network with bandwidth for Voice over IP (VoIP) and data transfer. These systems enable network opera-tors to perform video analytics, while also integrating data from remote alarm sensors and data collection and logging systems. This provides the network operator with the latest information and trend data to understand the complete operation of the business. Wireless Data Transport. The IP network—supporting a variety of video surveillance solutions such as PTP, PMP and Mesh networks can also be leveraged to transport data for a wide variety of applications. For example, the PTP, PMP and Mesh infrastructure can supply connectivity for video surveillance cameras to collect images while also providing connectivity for VoIP applications. A VoIP server will also be needed at the Network Center to support VoIP capability. Similarly, the IP infrastructure can transmit data. When an alarm server is added at the network center, numerous alarm gathering and reporting devices can report measurement or alarm conditions to the Command and Control Center. In these cases, sensors can complement the security provided by the video surveillance cameras. Each video surveillance system is uniquely tailored to meet the requirements of its environment. The majority of video surveillance systems—whether analog or IP-based— have a number of common network architecture elements. The Command and Control Center provides system operators with the ability to view real time video, control cameras and archived video images. These images are commonly displayed on many monitors simultaneously and may also be shown on a large screen format video wall. Users can access the video information from servers that are commonly located in the Command and Control Center. The Center provides system users with the network connectivity to the network and associated cameras, enabling network operators to provision, monitor and control the underlying elements of the video surveillance network. The Center is commonly equipped with network management servers, switches, routers and firewalls, and used to manage the connectivity infrastructure that supports the cameras. The Center may also be able to leverage equipment from the network operator’s communications infrastructure. For example, the video surveillance network and the communications infrastructure may use common servers, routers, switches or other components. Video cameras are distributed where required throughout the network to collect information and pass it to the network. Typically, enterprises have deployed analog CCTV video cameras that are connected via a coaxial cable to a video encoder that provides images to the Command and Control Center. When considering a video surveillance network architecture, it is important to bear in mind the inherent advantages of IP cameras. Since IP cameras can be connected directly to an IP network, an encoder is not required. Video surveillance networks provide network users throughout the enterprise with real-time visual connectivity for monitoring the organization’s most important and vulnerable locations. Video clients access the network to monitor live video information from the cameras or to view archived images from the video storage servers. Consider an enterprise where an existing CCTV network provides surveillance for the central offi ce, but now needs to have video surveillance at a remote or unmanned location across town. When surveillance is needed at a location distant from the Command and Control Center, it is diffi cult and time consuming to establish new coaxial connections to support additional cameras. Should a network operator require an extension to the existing CCTV network as well as existing analog cameras, an IP-based wireless infrastructure solution can easily be designed to extend the network through the use of an encoder to make IP connectivity possible. Although analog-based systems are proven to work in many applications, there are many others in which they are simply not as cost-effective or practical as a wireless system. Figure 4 illustrates an example of a wireless extension to a CCTV network. Extending a video surveillance network is an excellent opportunity to leverage the benefi ts of a wireless IP-based video network. In general, these extended solutions place IP cameras exactly where surveillance is needed. 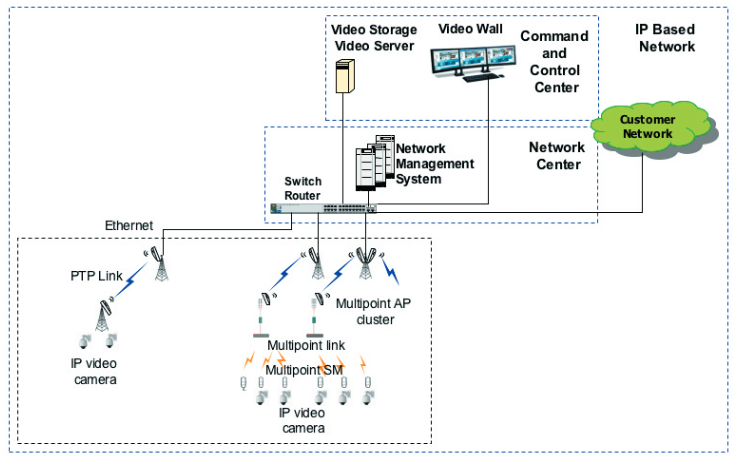 In an IP-based system, cameras are connected through a Point-to-Multipoint and Point-to-Point back-haul network that connects to servers located at the network center. • The PTP links transport the data across long distances between the network center and the PMP locations. • The PMP networks then distribute the available bandwidth to cameras positioned throughout the operating area. • The PMP networks are composed of Access Points (APs) and Subscriber Modules (SMs). • The APs can be co-located with the PTP or back haul links and distribute the signal to SMs placed at the camera location. The Ethernet connection from the wireless network is an industry standard RJ-45 connection that connects directly to the IP cameras. The wireless infrastructure can also provide secure and reliable connectivity to network clients in the Command and Control Center. Deploying New Networks Quickly When you’re considering deploying a new network, IP is very often the most advantageous technology choice. There are exceptions, however, in which a combination of analog and IP-based technology is a preferred option. In some ap-plications, network operators may want to add video coverage to a new location – such as another city or region – that is distant from the Command and Control Center. In these cases, the operator can easily use an existing fi ber network to establish connectivity to these locations. In this example, fi ber takes the place of the PTP backhaul and connects directly to the PMP Access Points supporting the video cameras. The PMP infrastructure can be used to provide connectivity for individual cameras or to provide bandwidth to a Mesh network wireless router. In most other cases, however, wireless infrastructure networks offer advantages analog systems cannot match. Wireless systems provide proven, cost effective, reliable connectivity that allows IP-based cameras to bring video surveillance capabilities to new locations in an exceptionally short period of time. Wireless networks can be used to create connectivity for a distribution network by using PMP APs that provide wireless connectivity to a large number of Subscriber Modules (SM) distributed throughout a geographic location. In addition, PTP and PMP modules can be combined to meet the throughput and range requirements of the network coverage area. In general, network operators can design networks with outstanding performance parameters, including throughput from 7 Mbps to 21 Mbps and a range of up to 15 miles. Figures 6 and 7 depict wireless network extensions using PTP and PMP modules. Some locations are diffi cult to reach even with NLOS PTP and PMP equipment. These may be the very locations where surveillance capabilities are most needed, such as locations between buildings or alleys. or PMP networks can be leveraged to supply bandwidth and connectivity to a mesh network. A mesh network is a self-forming network that can communicate with other mesh network elements to, in effect, go around buildings and into areas that are diffi cult to reach with wired or PTP wireless solutions. Mesh-based video pods can be set up quickly where needed to support surveillance in an incident scene or special event. These self-contained pods are easy to install and provide immediate video surveillance to an area already served by a mesh network. When mesh video pods are used, as shown in Figure 8, the PMP network can supply connectivity to the mesh network through one of the deployed SMs. In these cases, the mesh network becomes a “multi-hop” back haul configuration. The mesh capability enables connectivity to reach around obstructions such as buildings. This capability enables network operators to place the camera specifi cally where surveillance is needed. Once in place, the wireless network can be expanded to add mesh coverage in new permanent or temporary locations, such as a public event or an emergency situation. If additional capacity is required in the backhaul or infrastructure of the network, throughput increases may be added via a software key to PTP and PMP infrastructure. This enables additional capacity without requiring costly and time-consuming dispatches to the fi eld. Equipment can also be relocated and redeployed to another location when signifi cant capacity increases require the replacement of individual infrastructure modules. Figure 9 depicts ways in which to leverage the wireless backhaul network for Mesh networks. Mesh networks employ the 802.11 air interface standard. This standard enables fi eld staff access to critical video, voice and data information they need to perform their duties. WiFi enabled devices, laptops, VoIP phones and smart phones can access the mesh network and provide mobile access to information. In some cases, multiple agencies will want to share selected data across otherwise independent video surveillance networks. For example, in a natural disaster or other emergency situation, a school or hospital campus or an enterprise will want to share information from their video surveillance cameras with public safety personnel responding to the situation. A PTP link, as shown in Figure 11, will enable the command centers from these networks to share selected video streams on demand. These PTP links can be customized to meet the specific needs of the application. Wireless broadband infrastructure provides rapid deployment of reliable connectivity for video, voice and data. These systems can be used to not only enable video surveillance, but also to provide a common network with bandwidth for VoIP and data transfer. In addition, they enable network operators to perform video analytics, while also integrating data from remote alarm sensors and data collection and logging systems. This provides the network operator with the latest information and trend data, providing them with an organization-wide understanding of the complete operation of the business. Wireless broadband infrastructure can be deployed with confidence. Motorola wireless broadband solutions include tools to design, install and manage the network so that equipment works correctly the first time and meets design, cost and deployment time requirements. Wireless broadband solutions also provide an attractive lower total cost of ownership for the network operator, as equipment can be rapidly deployed to meet immediate demand. The unique requirements of each network will dictate the specific architecture that best meets the needs of the network operator. With a portfolio of wireless broadband solutions that are proven to provide cost-effective, reliable service, network operators can design the network that best meets their current and future requirements.